This article will tell you how to move your ScreenSteps Lessons library from one machine to another, for example from your desktop computer to a laptop. 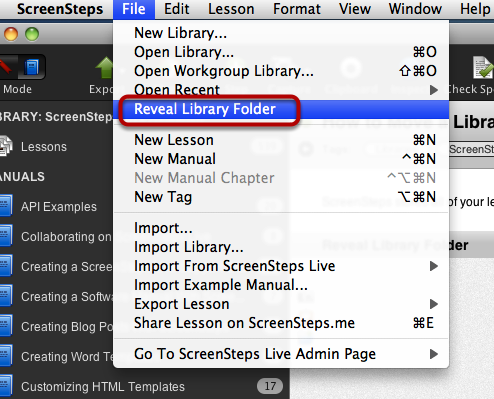 If your library is open in ScreenSteps you can use the File > Reveal Library Folder menu to reveal the folder in Finder or Windows Explorer. You need to copy both of these items. What you really want to copy is the folder that contains these two items. 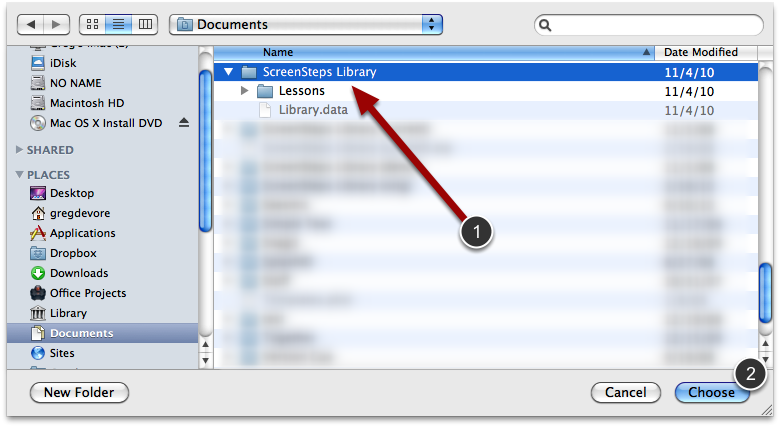 In the example above you would copy the ScreenSteps Library (3) folder. You can copy this over your network or onto a removable hard drive. 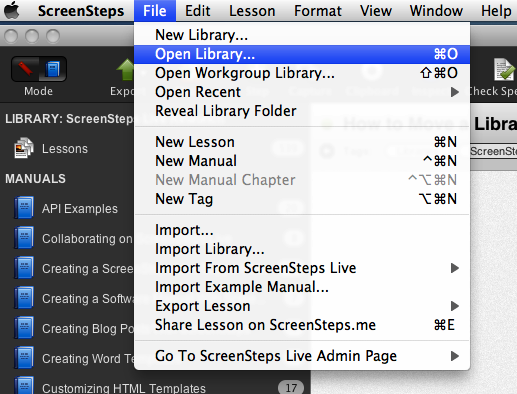 Once you are on your new machine and have launched ScreenSteps select File > Open Library. Hello, does anyone store libraries in Subversion (a source code repository)? I work on different computers and would like to be able to have a central location where lessons can be stored. I am not aware of people who use something like Subversion or Git with ScreenSteps libraries. The reason for this is that the ScreenSteps Library is actually a SQLite database. Checking a database into version control doesn't usually work very well. Some users use Dropbox but you need to be very careful that you don't have the same library open on two separate machines as you could end up with lost data if both computers try to write to the SQLite library file. After a windows restore I have lost all my lessons. when I look for the folder its there and all my media are there too but the library.data seems cleared since its become only 40kb whereas it was over 700kb before. Can I do something about it? @Jack It sounds like the library.data file was not restored, just the media folder. 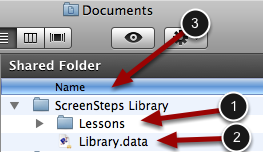 When ScreenSteps opens a library folder it will create a library.data file it one doesn't exist. Can you check your backup files for for the library.data file? Thank you Trevor for your response. Unfortunately, I had to go back to a previous restore point since I had a major Windows problem and I did not create any back up. @Jack I'm sorry to hear that. The strange thing is that everything else is working and I have no problems with any other software except for ScreenSteps. @Jack - ScreenSteps won't move or delete your data. The only other thing I can think of is that is that you had another ScreenSteps Library somewhere else on your computer. Have you tried searching for another library.data file? I know ScreenSteps won't do that but I think ScreenSteps might have an issue with Windows backup and restore mechanism. Yes I searched the computer for library.data but there was only one. All my media are there but like you said, the library.data seems to be deleted after a system restore. @Jack - The ScreenSteps library.data file is a standard file format in use by many applications (it is a SQLite database). I believe a Windows restore just puts files back into a state they were in previously. ScreenSteps will just try to open the file that is there on your computer. I would be very surprised if there was anything specific to ScreenSteps that would cause a problem during/after a restore. I think there is something else at play here.